Congratulations graduating seniors! You’ve worked hard for this moment, and congratulations are also in order for the parents, teachers and general support system that have nurtured your success. The best graduation present I can give you would be a recipe suitable for a graduation party or congratulatory dinner. It’s a recipe almost as hardworking and deserving of accolades as yourself, decked out for graduation ceremonies in ribbons and bows. Because, like a studious pupil in the classroom, this Greek Bow Tie Pasta Salad is a workhorse in the kitchen. Venturing out into the “real” world, dear student, you may want to distinguish yourself from your peers. This salad has the same ambitions and, with its colorful persona and crowd-pleasing taste, leaves the ubiquitous white potato salad and lackluster cole slaw in the dust. Will you be looking for employment after graduation? As mentors may have told you, supervisors think highly of those employees who maintain a neat work space. Bow tie pasta salad maintains a tidy work area as well. Unlike messy ropes of dangling spaghetti or other long noodle, bow ties are easily scooped out of the bowl with a serving spoon. I’ve watched in dismay as spaghetti salad slithered off serving utensils onto freshly washed carpet. Almost worse is observing guests navigate the long noodles to their mouths, standing in heels perhaps, and juggling their plate. A pasta bow is easily pierced with a fork–a plastic fork at that. The ability to plan ahead is an important skill for future success. This salad plans ahead, too: Cook the pasta and toss with the vinaigrette and feta 24 hours before serving. Keep in mind, however, that just as you’d review notes at the last minute before an exam, this salad would require the spinach, tomatoes, basil and olives be tossed with the bow ties a few minutes before serving. If a college or job interview is on the horizon, you may need a basic suit that can be dressed up, according to the situation. 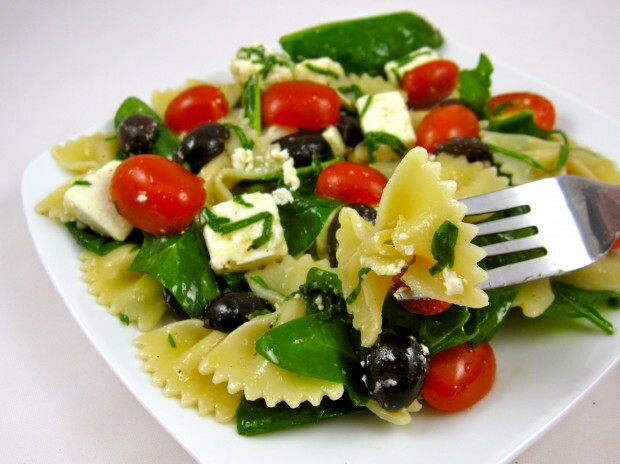 Greek Bow Tie Pasta Salad may be gussied up as well. Just as you’d dress up your suit with a colorful scarf or tie, toss this salad with grilled fennel, radicchio or quartered artichoke hearts. Add poached chicken breast or cooked shrimp and you’re serving a main course salad. Are you bilingual? This attribute is certainly a marketable feather in your cap. Worldly Greek Bow Tie Pasta Salad is as conversant in Italian as it is in Greek: Substitute balsamic vinegar for the lemon juice and Parmesan for the feta and the salad is fluent in Italian. We’re living in a challenging economic environment and the flexibility to relocate to another state, may be required. This salad is happy to relocate–spoon the contents into Ziploc bags, place in an iced cooler and go! By the way, did I mention the salad was proficient in math? The ingredients may be divided or multiplied to suit your particular needs. Whisk together lemon juice, garlic and oil. To make basil ribbons (chiffonade), roll 3 basil leaves together tightly, cigar-style. With a sharp knife, cut rolled leaves into thin ribbons. Repeat with remaining basil leaves. Toss pasta with dressing, spinach, olives, tomatoes, feta and basil ribbons. Season to taste with kosher salt and freshly ground pepper. *I used a 7-ounce package of Valbresso French Feta cheese, and cut it into cubes for this recipe. More Recipes Filed Under "Pasta salads"
I’ve never heard of this magazine. I’m intrigued. I got a free one-year suscirbption to Taste of Home a few years ago and I liked that. I enjoy getting snail mail full of pretty food pics!